John Houbolt talking about LOR. John Cornelius Houbolt (April 10, 1919 – April 15, 2014) was an American aerospace engineer for NASA. 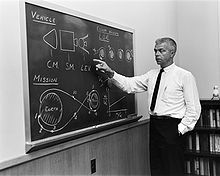 He is best known for his work on the lunar mission mode called "lunar orbit rendezvous" (LOR). This was chosen for Apollo program in early 1962. He was born in Altoona, Iowa. Houbolt died from natural causes on April 15, 2014 in Scarborough, Maine, aged 95. ↑ "John Houbolt, NASA engineer who fought for Apollo moon landing method, dies". collectSPACE. April 17, 2014. Retrieved April 18, 2014. This page was last changed on 8 June 2017, at 18:49.